I'm far from the first person to design a pennant card, but a celebration is in order when there's a new graduate in the family. Rumor has it he checks in here from time to time... hello, youngest son! After completing umpteen years of school this week, he's in the midst of job interviews, so instead of Congratulations, (too many letters to fit the space anyway, ha) I went with a most heartfelt 'good luck' sentiment. I used Faber-Castell Gelatos to make the vertical color swipes on heavily textured cardstock. (They're so much fun; you'll feel like a kid with a box of new crayons!) The letter-stamped triangles were glued to an embroidery floss roping - two bright colors twisted together and stiffened with glue - fastened in place with gold brads. For a more traditional look, this perfectly quilled mortarboard and diploma card from Suzana Ilac would make a graduate feel extra special. See additional photos of the clever design on her blog, Quilling with Fun. 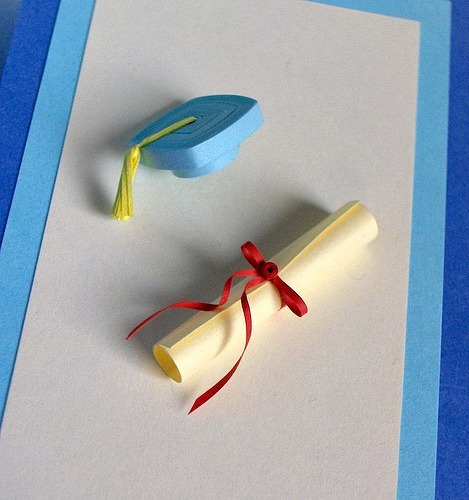 Have you made a graduation or good luck card you'd like to share? I hope you'll leave the link in the comment section for all of us to enjoy. Ann, I would also like to Congratulate son no.2!! May he have much success in his future career...good luck to him! I did made a congratulation card for my oldest daughter when she graduated from uni...a bunch of bright flowers with a mortarboard. 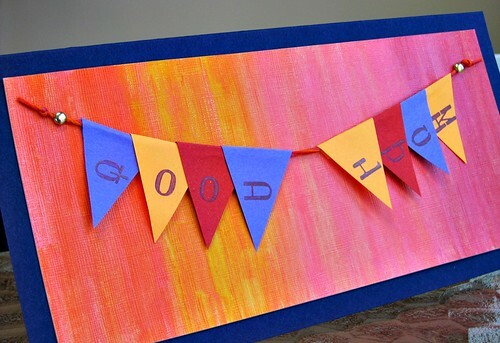 Ann your 'good luck' card is fabulous.....I love the bunting and the colourful background made with the gelatos...what a great effect they create. Suzana's grad card is clever and I just adore her bib cards on her blog. Congratulations to your younger son on graduating Ann ,and good luck to him for a great future. Your card looks so good Ann. Bright and colourful!. I love Suzana's too she is one of my favouite quillers. Love it!!! I know how much you enjoyed making this card and I think it is extra nice that he sees your blog from time to time! WOW Big 'Congratulations from Texas' to your son and wishing only the best for him in the years ahead. And I do love Suzana's cute card! Congrats to your son, love the card!! That's such a guy thing to say! Nice for you, though: your cards can do double duty! It came out really cute. I like the font on your letter stamps. And congrats to him for graduating! I love the overlapping pennants - what a simple, yet brilliant idea. I did some pennants not too long ago, and was struggling to get a longer word to work - this is great! And, I love the gelatos, too. The colors are so vibrant, and the shimmery ones are fun, too! Nice! You always do such a great job!!! Thanks everyone! I realize in looking again that the pic makes the card look quite pink - it's more red in real life. Casey, I'm glad you mentioned the font as I like it too. It's a set of vintage alphabet stamps called Breite Italienne. Congratulations to your son, Ann and good luck regarding his job interviews. Besides a sentiment, I love the background, too. And, thank you, Ann for an honor that my card stands next to yours!